Meadow View Treehouse is a charming retreat. A place to relax, indulge and entertain from a truly unique treetop building, nestled away on a private 9 hole golf course within the estate grounds. Imagine, an enchanted tree house sitting in a prime and peaceful location, stooped in nature. A hideaway that looks out onto the unspoilt vista and takes the client back to their childhood days. Peacefully listening to the sounds of nature and taking in the natural sights, sounds, and smells. Meadow View Treehouse – A place where imaginations can run wild. Meadow View is just one of the turnkey tree houses we lovingly design and construct. Providing the client with a secluded space of their own, to be enjoyed day or night, indoors with the rustic woody scents, or al-fresco from under a blanket of stars. We create a truly distinctive place, intended for adults to spend time in a remote and peaceful part of their estate; relaxing, entertaining with friends or creating lifelong memories with their children in this elevated and extraordinary luxury tree house. It is the intricate detailing throughout that makes the client feel like they are in a truly magical place. The backdrop and outside setting belong to the client’s estate; the internal elements of Meadow View Treehouse are entirely inspired by one’s imagination. The dream of owning a custom luxury tree house is rapidly transformed into reality with Blue Forest. With experience far and wide, we know the finest materials to use to create an authentic tree house, with a touch of rustic and luxurious comfort that you would expect from such a place, befitting of the client’s estate and specific requirements. Meadow View Treehouse is constructed with sustainable, long-lasting wood, the windows and doors are entirely handmade and custom built from Oak. The treehouse is topped with a copper turret and has a delightfully English thatched roof. Up lights, downlights, mood lighting, the decorative details are all completely built around the client’s wants and desires. There is space inside for the client to prepare and serve drinks along with a dormer window for reading, gazing, relaxing or unwinding in complete and utter quiet. The sounds and scents of the natural surroundings coupled with the beautifully woody Cedar smells throughout, deliver outside living from the comfort of this treehouse haven, giving the client a secluded oasis they can enjoy as they wish. With outside decking and an abundance of natural light pouring in through the windows, this rural retreat will allow the client to truly feel at one with nature, spend time bonding with friends and creating family memories while being able to completely disconnect from the busy world outside. At Blue Forest, we help transform the client’s dream of owning their bespoke luxury tree house easily, making the entire experience thoroughly momentous. Each Treehouse from Blue Forest blends sustainable and luxury living to excess. 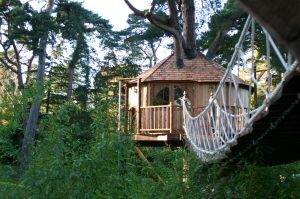 A blissful retreat, an outdoor haven and a little piece of paradise beckon with Meadow View Treehouse. 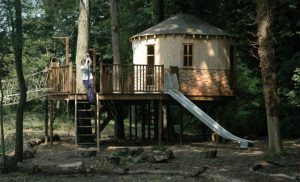 Spinney tree house was built in a small spinney at the bottom of the client's garden. It is the ideal den for the children and features a host of different play items to encourage them to enjoy the beauty and adventure of the natural setting.